The combination of the natural materials is what stands out about the COR Intuition bag from ONO Creations. You'll find that this yoga tote is not only made of cork, but a combination of natural materials such as OEKO-TEX certified tencel®, bamboo, organic cotton and reclaimed teak. Each COR Intuition bag is not only made of sustainable materials, but is also produced with skilled artisans under fair conditions in a transparent process. Eco Cork Yoga Totes are Made in Portugal from a process that has been handed down from generation to generation. This beautiful EcoCork bag is hand cut from soft cork 'leather', a natural, sustainable renewable resource. What stands out about this green yoga tote is the two available color options of brown or natural. What we love about the Yoloha Cork Yoga mat is not only the sustainability, but the extra mile when it comes to functionality in this yogi tote. Big enough to fit everything from your yoga bag to non slip mat and water bottle. So forget the gym bag, this is both a gym bag as well as a yoga tote. One for One: When you purchase a Giving Nomad Cork Yoga Mat from Yoloha, Yoloha gives a cork yoga mat to an underprivileged child with your inspirational quote. Cork Nature offers artisan made beautiful cork yoga totes in three colors brown, natural, and a grayish light blue (honestly though the light blue takes the cake for the most chic looking cork yoga bag). Now based in Seattle, the roots of this company come from the Medeterrain where cork harvesting and production is a trade that has been in the family for centuries and for many a way of life. 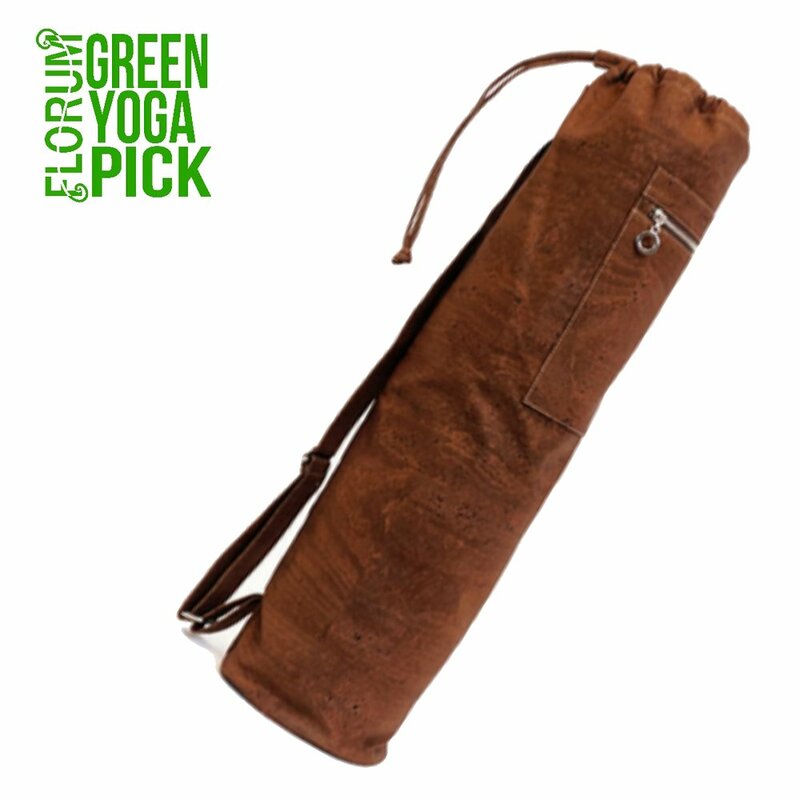 This sustainable yoga bag has a comparable texture to nubuck suede and is handmade in Portugal. The cork material used to create this yoga tote is water resistant, easy to clean and fire resistant. We love that you can find over 100 sustainable and ethical cork designs and products on Shop Cork Designs website. Before looking into the sustainability of cork, I was under the impression that Cork Trees were endangered. However I quickly learned that because the most common use of cork (wine corks) have begun to be replaced by screw tops or even plastic corks, the demand for cork has begun to decline. Cork Trees can live up to 300 years, yet their bark is only harvested every 9-12 years (meaning its not a crop with a high return each year and farmers must be subsided by the EU). Help save these ancient trees by selecting a bottle of vino that use real wine cork (not even joking that buying wine can help) as well as cork products such as the beautifully crafted yoga totes. And if you're still interested in learning more, check out and watch the Youtube clip below to learn the full process on harvesting cork and its future.